Ladies and gentlemen, meet my next racquet! These are strong words coming from a guy who has NEVER liked a Wilson racquet of any generation, but there you have it. From the first hit to the last (before I put it back in the shipping box), I loved how this racquet complemented virtually every aspect of my game. So let’s dive right in for some detailed thoughts on this rare Wilson unicorn. 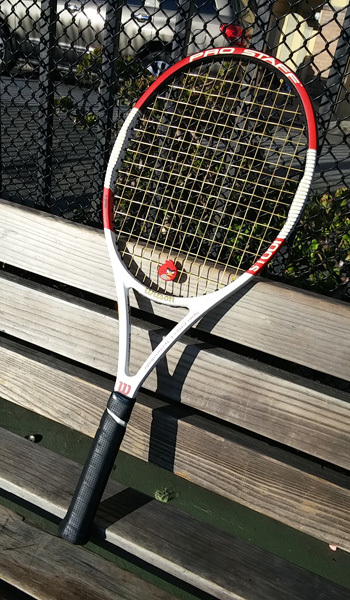 The 100LS is a fairly light racquet. It’s 10.6 oz. strung weight is a full ounce lighter than the 11.6 oz. weight of my current HEAD Speed MP 315 (18×20). Generally speaking, I’m not a fan of light racquets because I’m a big, strong guy with a tendency to swing too fast. But rather than feeling like a toy racquet, the Pro Staff 100LS felt solid in my hand during the swing as well as on impact with the ball. The lighter weight also gave me added maneuverability on the court, allowing me to get to balls that might normally be too difficult to reach, and actually being able to do something once I got there. With its’ 16×15 string pattern, the 100LS has been promoted as a racquet that will give you more spin with better control. I can’t vouch for the spin part since my stroke production already promotes spin. What I can vouch for, however, is the incredible depth and power of shot I was able to create with this racquet. The benefit to my forehand was clear on the first strike. The sound of the ball coming off the strings was like a Howitzer. My already pace-filled shot became an even more powerful weapon with this stick. At one point while receiving during doubles, I hit a passing shot that virtually left a smoke trail as it whizzed by the opposing net man. I can certainly hit shots of that caliber with my current stick, but not with the same ease or frequency. The benefit to my two-handed backhand wasn’t nearly as dramatic, but that was okay as long as there was no performance deficit. Initially, it was tough to get “touch” and/or depth on my backhand slice shots. That was remedied by a taking a more deliberate stroke with a slightly bigger backswing. Also, a reduction in string tension would probably provide better overall feel. The Howitzer effect mentioned earlier with regard to my forehand was also present on my serve. Well-struck serves were unreturnable. Decently struck serves were still winners. Overplayed serves hit the back fence, so it was necessary to make sure that I maintained the proper grip (with a relaxed arm) in order to minimize double faults. The two words I would use to describe my experience at the net with the 100LS are forgiving and solid. The aforementioned maneuverability of this stick allows for those with less than stellar volley technique, like myself, to make solid volleys from less than ideal positions. And generally, the ball stayed down nicely. I even made more than a few stellar stick volleys, though the racquet ‘had me’ after the first one. Though my HEAD racquets have served me well for the better part of 5 years, there’s simply no comparison. Forehand, backhand, serve, and volley: there was absolutely no part of my game that didn’t benefit from the Pro Staff 100LS! In fact, I would buy a couple right now if I had an extra couple of hundred bucks lying around. Stiffness is the only potential problem I can see for this racquet. Too many mishits could be a recipe for tennis elbow in a player with a tendency towards either mishits or tennis elbow. I had a few mishits on serve, and felt the impact immediately in my arm; though not enough to make me stop hitting. As mentioned earlier, however, lower string tension (or a different kind of string) could help with this. The demo I used was likely strung midrange at 59 pounds, 7 higher than my current stick. Lowering the tension to 54 would give it a softer feel, and probably help cushion the impact of mishits. 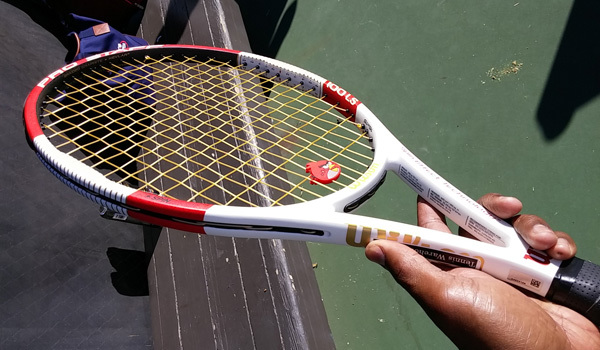 Note: If you’re interested in this (or any) racquet, take it out for a hit and judge for yourself. Racquet specs and marketing-speak are no substitute for knowing the strengths/weaknesses of your game, and how a racquet might help or hurt your goals. I’ve bougth 2 of these sticks after I read the comment on tennis warehouse. At my first try with the original strings at 24 kg, it felt like dead. The spin was a bit more than my babolat pure drive GT107, but I lacked power and depth. It was also not that stiff, one of the the main reasons for bying this racket. I strung the racket before my second try with Luxilion 4GL Rough 1.25mm at 23 kg. Still the racket did not feel good. I was about to sell these news rackets but then I added 3 grams to 3 and 9 o’clock. Now at my third try, the racket was much much better. More power but less than my Babolat, more control and bigger sweetspot than my 107 Babolat. But a problem could be the strings breaks easily after 2-3 hours of play. So it tends to be a costly operation.